Enjoying live music, delicious food, an auction with incredible items, and the chance to meet Big Ben…all for a great cause! 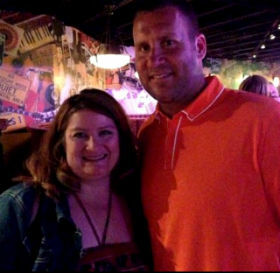 You can start by purchasing your tickets NOW for the Third Annual Ben Roethlisberger Foundation Fundraiser on June 22nd, at Jergel’s Rhythm Grille in Warrendale, PA. Proceeds from this awesome event will benefit K-9 Police and Fire Units throughout the country, and Make-A-Wish®. You’ll spend the evening with Ben, his family and his teammates while sampling amazing strolling dinner fare, a live and silent auction, and listening and dancing to the music of NightSong! Tickets will go fast, so purchase yours now! Don’t miss out! “My husband and I had a great time at the fundraising event last night with Ben and all the other players. Ben was humble and polite when I came in contact with him. I want to thank him for his hospitality. It has become an infamous story today about my husband starting a conversation because I was a little awestruck. Ben literally said, “Oh, I’m Ben by the way…” while we were talking to him and shook both our hands. That was sincere. My husband and I are both children services social workers so we work a lot with the police departments in the counties we work in. It was definitely a good cause .” — Mikki Deal-Hendon (photo above). 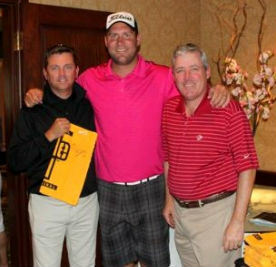 Join Ben on the course and in the clubhouse at the beautiful Treesdale Golf and Country Club in Gibsonia, PA on June 23rd for the Third Annual Ben Roethlisberger Foundation Invitational! The tournament last year was not only a lot of fun, but a huge success – raising over 100,000 for both of Ben’s Foundation causes: the Make-A-Wish Foundation of Greater Pennsylvania and Southern West Virginia as well as K-9 Police and Fire Units across the country. 118 golfers, including teammate and friend Brett Keisel, Mr. Art Rooney II, Steelers Great Franco Harris, Penguins Great Mario Lemieux, and former Steeler and current ESPN NFL analyst Merril Hoge, joined Ben for a full day of golf, games, food and a raffle. You bet! Golfers enjoyed both a lunch buffet served on the patio before heading out on the course, and a delicious dinner in the clubhouse after the tournament featuring several buffet stations. On the course, the golfers were treated to made-to-order Primanti Bros sandwiches from a specially prepared golf dining cart! *Thank You to all of the many sponsors for both events this year: Sprint, Kyocera, Jergels Rhythm Grille, Rep1 Sports, Make-A-Wish of Greater PA & WV, Merril Hoge & his Find A Way Foundation, Robertson, Griege & Thoele Financial Advisors (RGTNET), Nemacolin Woodlands Resort, The Steelers, A&L Motor Sales, Compliance Staffing Agency (CSA), UPMC Health Plan, Lionworks Printing & Graphics, and the King Street Grille. **And thank you to Jessica Duffaut at the Giving Back Fund, Justin Aquilante at ProServ Events, Sheila Weiner & Cortney Stitt at The Event Group, Dan Jergel, and Teresa Varley, Steelers.com! ← April’s Fan Photos are here!